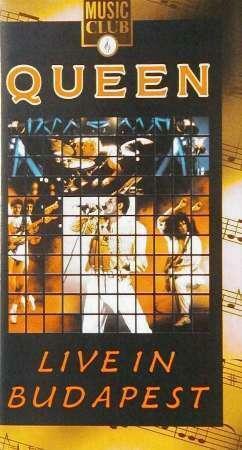 'Live In Budapest' : released on VHS only on 16 February 1987. Length 87 minutes. 'Hungarian Rhapsody' : released on DVD and Blu-ray on 5 November 2012. Length 91 minutes + 27 minutes bonus features. 17/2.3. Is This The World We Created? Recorded at the Nepstadion, Budapest, Hungary, on 27 July 1986. Additional keyboards and guitars by Spike Edney. 'Live In Budapest' was released in 1987 and features an edited version of the concert at the Nepstadion in 1986. Seven of the tracks are edited, while four are omitted altogether. 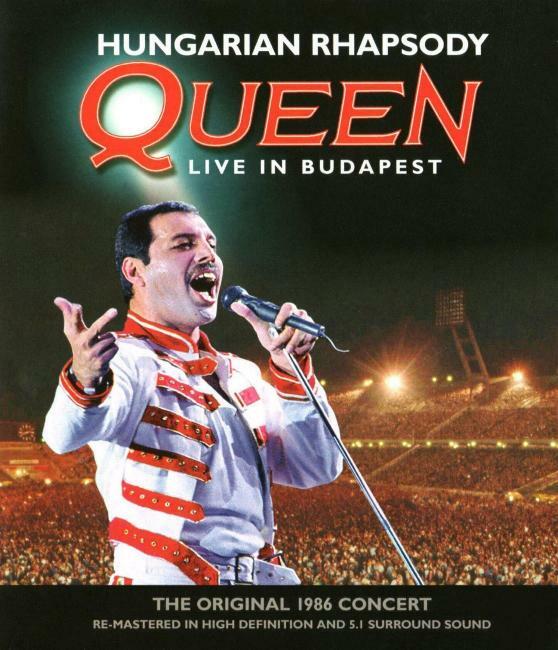 The video also includes four additional inserts during the concert, featuring footage of Queen in and around Budapest. The start of the video features an a-capella version of 'Tavaszi Szel Vizet Araszt', with aerial footage of Budapest, and time-lapse photography of the stage being set up and the audience arriving, as 'One Vision' starts. Insert 1 features footage of Queen arriving in Budapest, Freddie shopping, and him practising 'Tavaszi Szel Vizet Araszt'. He then rehearses his sinaglong in the empty stadium, before the video cuts to the singalong from the concert itself. Insert 2 appears during Brian's Guitar Solo (the sound is still audible but much quieter than normal) and features footage of Brian in Budapest, and going up in a hot air balloon. Insert 3 features footage of John in Budapest, talking to local people, while insert 4 features footage of Roger at a go-karting circuit, racing and signing autographs. 'Hungarian Rhapsody' was released in 2012 and is a remastered version of the video. It was released on both DVD and Blu-ray, with some versions including a double CD of the concert, featuring the full versions of all songs plus the missing four tracks, to give the complete show (disc 1 lasting 57:46, disc 2 lasting 48:53). In terms of the concert and inserts, the video footage is absolutely identical, with the same edits and camera angles (but a vastly improved soundtrack and picture). The only real differences between the two releases are that 'Hungarian Rhapsody' has new opening and closing credits, and runs at the correct speed, whereas 'Live In Budapest' runs approximately 4% faster so all songs are slightly shorter. The main menu and sub-menus simply feature audience noise. The options for both DVD and Blu-ray are to play the concert (title 1), select a song, play the 'A Magic Year' documentary (title 2), select subtitles (English, German, Spanish, French, Italian or Portuguese) or change audio (Audio LPCM stereo, or DTS surround sound). The DVD menu has proper submenus, while the Blu-ray menu appears as a horizontal band with popup menus. Both the DVD and Blu-ray contain 30 chapters, with 23 being actual songs, 4 being inserts, 2 being the very start and end, and the remaining chapter being an intro improvisation to 'Tutti Frutti'. Only the 23 songs themselves are available through the song selection options. The DVD and Blu-ray add a bonus documentary titled 'A Magic Year', as title 2 lasting 26:54, which tells the story of the year from 'Live Aid' upto and including the Budapest show. It features interviews with Freddie, Brian, Roger, John, Jim Beach, Bob Geldof and 'Highlander' director Russel Mulcahy, about the film, 'A Kind Of Magic' album, songwriting, and touring. It features clips and out-takes from the various 'A Kind Of Magic' promo videos and the 'Highlander' film, tour rehearsal footage (which is different to that released on the 'Live At Wembley Stadium' DVD's), concert footage from Ireland, Mannheim, Newcastle, Budapest, and Knebworth, and various TV reports from the time. Before it's release, 'Hungarian Rhapsody' was shown in theatres and cinemas worldwide from 20 September 2012 onwards, with the 'A Magic Year' documentary as the opening feature. The concert itself was later broadcast (presumably in it's entirety) on BBC Four at 10:30pm on 29 December 2012. Chapter 2, or Disc 1 Track 1. Track length 5:37, song length 5:35. Chapter 3, or Disc 1 Track 2. Track length 4:41, song length 3:44. The video releases feature an edited version of the track, lasting 1:55, which omits the section from 1:04 to 2:53. The end of the CD track includes a short Singalong, lasting 27 seconds; the video releases omit most of this, only including Freddie's vocals from 4:26 onwards. Chapter 4, or Disc 1 Track 3. Track length 2:17, song length 2:17. Chapter 5, or Disc 1 Track 4. Track length 1:41, song length 1:41. The last 21 seconds of the track are actually the start of 'Tear It Up', giving a true song length of 1:19. Chapter 6, or Disc 1 Track 5. Track length 1:47, song length 1:47. This track segues from 'Seven Seas Of Rhye' and into 'A Kind Of Magic'. The last 21 seconds of 'Seven Seas Of Rhye' are actually the start of this track, giving a true song length of 2:08. Chapter 7, or Disc 1 Track 6. Track length 8:20, song length 6:27. The CD track comprises 'A Kind Of Magic' itself, Freddie's complete Singalong, length 1:09 (from 6:51 to 8:00), and a short bass and drum improvisation lasting 15 seconds (from 8:03 onwards). On the video releases, Freddie's singalong begins with him rehearsing in an empty stadium, then cuts to the concert singalong, equivalent to around 7:13 onwards, lasting 1:02 in total. This track segues from 'Tear It Up', and also appears on 'Live Magic', mixed with a recording from Knebworth. Details of the original version can be found on the 'A Kind Of Magic' album page, while details of other singalongs can be found on the Live Solos & Improvisations page. Freddie: This is a lovely feeling tonight, really. Would you like to sing with me? Chapter 9, or Disc 1 Track 7. Track length 3:50, song length 3:27. This track also appears on 'Live Magic', mixed slightly differently. Freddie: Hey. We're gonna do a song with a stronger beat now, a little bit of a boogie. You know what I mean? Disc 1, Track 8 (not released on the videos). Track length 4:56, song length 4:07. Chapter 10, or Disc 1 Track 9. Track length 3:59, song length 3:58. Chapter 11, or Disc 1 Track 10. Track length 3:33, song length 3:26. The video releases omit the synthesiser intro, starting with the keyboards at 0:26, reducing the time to 3:00. Disc 1, Track 11 (not released on the videos). Track length 3:38, song length 3:36. This is an improvised track, very similar to 'Impromptu' on the 'Live At Wembley' releases, featuring all members of the group. Almost all of the vocals are ad-libbed and undecipherable. Details of other improvisations can be found on the Live Solos & Improvisations page. Chapters 12 and 13, or Disc 1, Track 12. Track length 7:23, song length 7:19. Performed by Brian alone, with no contribution from other band members. The video releases feature an edited version of the track, which goes quieter in the middle as there is insert footage of Brian over the top. The track lasts 5:53 in total, with the louder sections being from the start to approximately 4:23 and then 6:28 onwards, with an unknown section edited out of the middle. On both the DVD and Blu-ray, chapter 12 includes the start of the solo, while chapter 13 includes the insert and the reprise. Details of other guitar solos can be found on the Live Solos & Improvisations page. Chapter 14, or Disc 1 Track 13. Track length 6:00, song length 5:43. Chapter 15, or Disc 2 Track 1. Track length 4:37, song length 4:01. The video releases feature an edited version of the track, lasting 2:41, which omits the section from 2:55 onwards. Freddie's dialogue at the end ('now comes the difficult bit') is moved so that it is over some of the guitar, at around 2:52, so the track almost segues into 'Tavaszi Szel Vizet Araszt'. Chapter 16, or Disc 2 Track 2. Track length 2:16, song length 1:50. This is an acoustic track, performed by Brian and Freddie, and is a traditional Hungarian song. The very start of the video releases (chapter 1) feature a short a-capella version, lasting 0:23, which is derived from the concert performance. It does not include any guitar or audience noise, but does have a helicopter sound effect underneath. The first insert (chapter 8) also includes a short excerpt of Freddie rehearsing and practising the tune, lasting 0:19. Chapter 17, or Disc 2 Track 3. Track length 2:32, song length 2:25. Disc 2, Track 4 (not released on the videos). Track length 1:29, song length 1:23. Disc 2, Track 5 (not released on the videos). Track length 2:24, song length 1:15. Brian May sings lead vocals for two lines. From 1:27 onwards, the track includes an acoustic improvisation, which is the warm-up to 'Tutti Frutti'. 'Hello Mary Lou' was not included on the video and DVD releases, but this improvisation was, as chapter 18. Chapter 19, or Disc 2 Track 6. Track length 3:36, song length 3:27. The video releases feature an edited version of the track, lasting 2:46, which omits the reprise from 2:46 onwards. Chapter 21, or Disc 2 Track 7. Track length 5:30, song length 5:13. Footage of Freddie performing this track was later used at Queen + Adam Lambert shows in 2012. Chapter 22, or Disc 2 Track 8. Track length 5:06, song length 4:49. The video releases feature an edited version of the track, lasting 4:07, which omits the section from 3:26 to 4:07. Chapter 23, or Disc 2 Track 9. Track length 4:53, song length 4:30. The video releases feature an edited version of the track, lasting 3:31, which omits the section from 0:24 to 1:23. Chapter 25, or Disc 2 Track 10. Track length 6:12, song length 6:04. On the video releases, the track segues from the insert of Roger at a go-karting circuit, so as a result, the first few seconds of the track are mixed with engine noises. Chapter 26, or Disc 2 Track 11. Track length 3:02, song length 3:00. This track was released as a bonus streaming video as part of the 'Absolute Greatest' release in 2009. The track is identical to normal, but omits Roger's count-in at the end. Chapter 27, or Disc 2 Track 12. Track length 2:01, song length 2:00. Chapter 28, or Disc 2 Track 13. Track length 3:52, song length 3:51. Chapter 29, or Disc 2 Track 14. Track length 1:23, song length 1:08. Freddie: Goodnight, thank you very much, you beautiful people. God bless you, we love you, goodnight.